The ultimate core strengthening workout focusing on the abdominals, obliques, and back. All muscles will gain strength and flexibility through a series of movements on the mat and using the ballet barre. 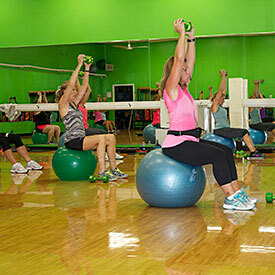 The class is based on the principles of Pilates and Pure Barre. Although the focus is on the core, expect a to incorporate other muscle groups to get a total body workout. "I had never taken Pilates before prior to taking Lisa’s class. Lisa taught the class in a way that was relatable to everyday activities that have improved my core strength, breathing methods and even my posture at work! Every week she used different tools and movements to challenge us and give variety to the class. I can’t imagine the time that she spent preparing for class. There was a comfortable welcome feeling that I felt walking into her class that made me look forward to coming. She always took the class a step further by bringing print outs about Pilates, cool towels for relaxing, and emailing asking us for feedback that I have never experienced with other instructors. She made me feel part of a group."